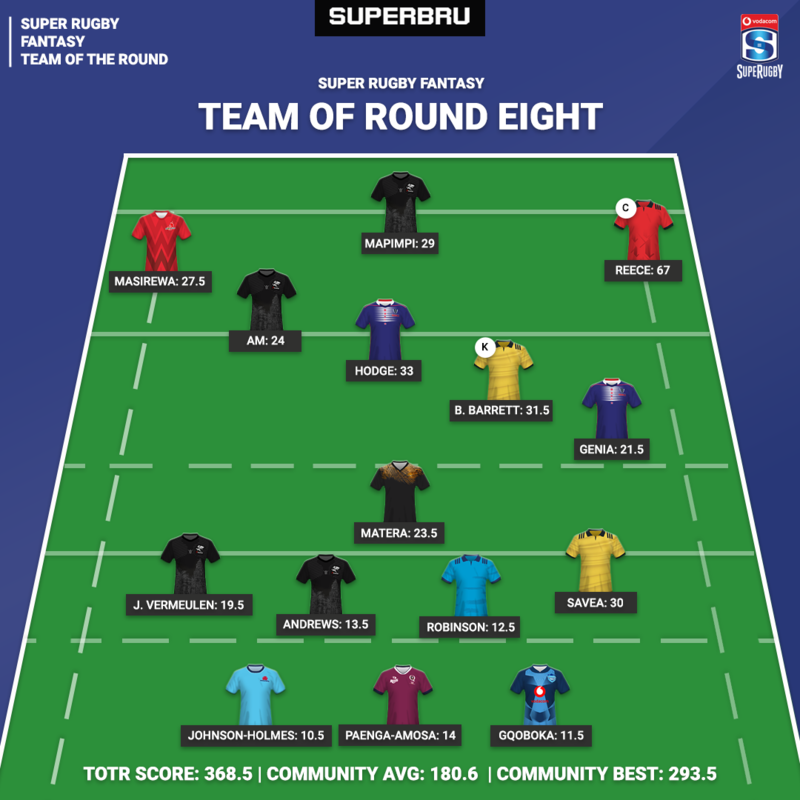 Given that just 14% of the Superbru community picked the Sharks to defeat the Lions on Saturday, it's probably fair to assume that most of you weren't exactly filling your team with their players for Round 8. However, that crushing 5-42 victory saw many players score very well in our fantasy game as you'd expect, and they've contributed significantly to what is a quite high scoring Team of the Round and community average. Most represented teams in this week's TOTR: Sharks (4 players), Rebels, Hurricanes (2 players). Perhaps surprisingly, only one Crusader makes this week's team following their 22-point win over the Brumbies. However, that's mainly down to how well other players have scored across all positions in this round and the fact that said Crusader, the Round 8 ideal captain Sevu Reece, has taken so many fantasy points himself! Reece stars in an Outside Back trio of wingers along with Makazole Mapimpi and Semisi Masirewa who retains his TOTR place after scoring 33.5 points in Round 7. That isn't to say there isn't a fullback in this team though, as Rebels' utility back Reece Hodge continues to play at 15 but is positioned as a centre in our game. Hodge's teammate Will Genia also continued his excellent season with a good performance against the Sunwolves - no scrumhalf has scored more fantasy points so far this season. Moving on to the forwards and Ardie Savea stood out with another fantastic display in this round, helping his team to an impressive away win against the Highlanders. Lizo Gqoboka retains his TOTR place despite the Bulls losing to the Jaguares in a game that included a Pablo Matera try which helped him to a place in this team too. 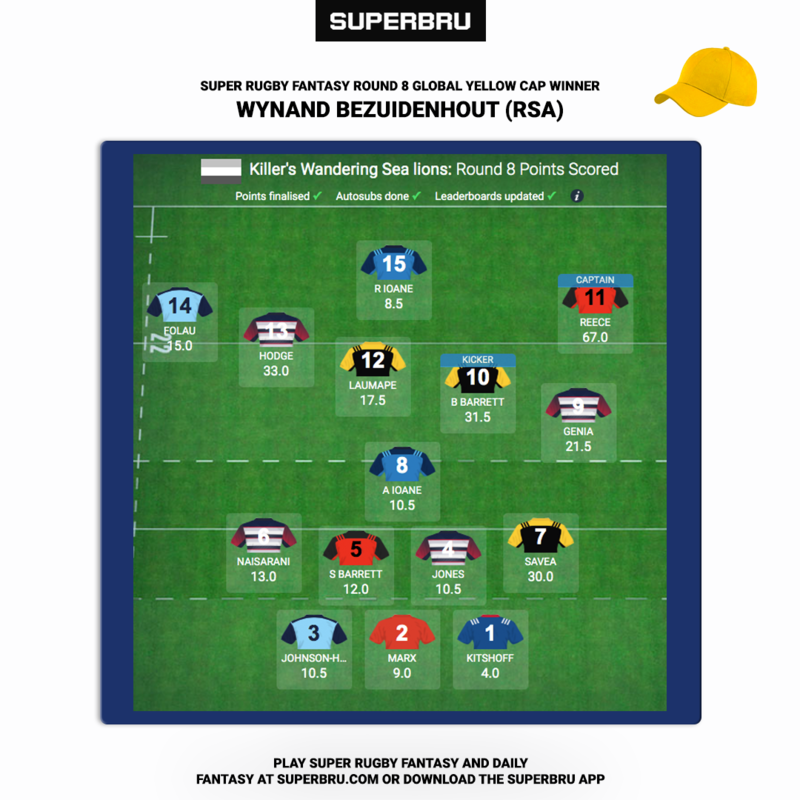 This week's best performing bru in the whole of our SR fantasy game was Wynand Bezuidenhout from South Africa! As you can see below, Wynand captained Reece and selected Hodge, Barrett, Genia, Savea and Johnson-Holmes! Here's the team that scored a staggering 293.5 points. Some careful squad management is now required (as if it wasn't already!) as we face two rounds with just six fixtures taking place. Be aware that KO timings may change your deadlines due to NZ daylight saving. This week the Hurricanes, Sunwolves and Waratahs are on a bye with the Crusaders, Jaguares and Bulls not playing in Round 10. Daily Super Rugby fantasy game is a waste of time. SuperBru don't put any effort in to update the records. Come match-day 90% of the players aren't even playing. Despite the fact that Schalk Brits is suspended his name appears on the list just to name but one example. I resign from that stupid competition today.